Innovation in microscopy does not happen every day - ask Charles Darwin! However computer technology has caught up with the microscope at last. Now we have cameras that are really microscopes and microscopes that are really cameras. As is always the case with innovation there are choices that are often confusing. Here we try to make the choice easier. Handheld microscopes are indeed microscopes that can be used like cameras and although they do have a more limited range of magnifications than conventional microscopes their main advantage is in their portability. 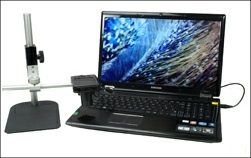 They can be used easily in places where conventional microscopes ‘cannot go’ and connect directly to a lap top or PC by USB cable. For those just interested in the world around them they can provide a fascinating insight and are excellent as a family teaching tool that can make science fun. In the commercial world and industry they can be invaluable for presentations and examining items in situations that preclude the use of a standard microscope. Whilst they are designed to be hand held they do benefit from the use of a stand which makes steady focusing easier. We are pleased to offer a select number of models from our own brand with a larger range from the industry standard Dino-Lite brand. Clicking on the logos below will take you to the choices.